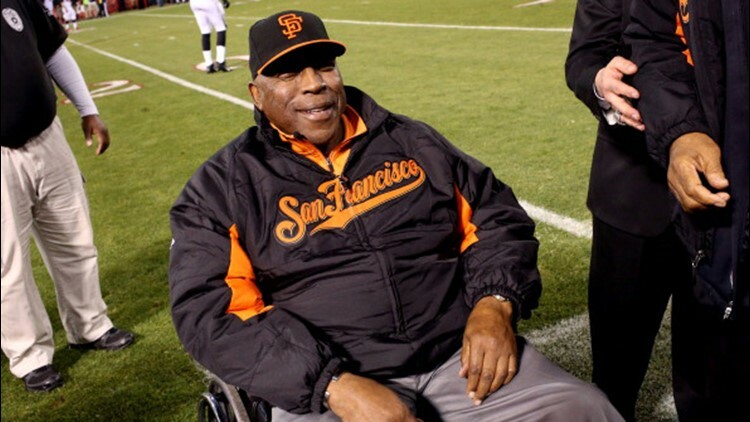 Former San Francisco Giant Willie McCovey on the field prior to the last regular season game at Candlestick Park between the San Francisco 49ers and the Atlanta Falcons on December 23, 2013 in San Francisco, California. The baseball legend died peacefully Wednesday afternoon after a long history of 'health issues,' San Francisco Giants announced. SAN FRANCISCO — Willie McCovey, the sweet-swinging Hall of Famer nicknamed "Stretch" for his 6-foot-4 height and those long arms, has died. He was 80. The San Francisco Giants announced his death, saying the fearsome hitter passed "peacefully" Wednesday afternoon "after losing his battle with ongoing health issues."